If someone would mention the name “Lorenzo De Angelis” in the horse world would often get reactions like: “Who?” This is NOT so strange. But if someone went from time to time to the Newmarket Racecourse would occasionally notice some old lady with a smile on her face because he gave her the right advice on the winning horse. Many greet him but they do not even know his name! 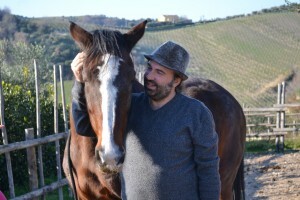 Lorenzo has been through a personal journey and went through the study of a lot of different riding school of thoughts. For many years he kept silent working with the finest horse masters, keeping himself for himself. He met a lot of professionals and saw how they in general interacted with horses and thought “there must be a better way”. The equestrian world is still stuck with a behaviour model. Lorenzo has been constantly working, gathering material and transforming it thanks to his own ability and the generosity of his masters. He’s main interest has always been the equestrian art and its technique which is only true when expressed through the highest degree of freedom. His philosophy can be traced in his recent Book: The horse out of dusk. The objective of his work is not to dominate but to let things happen. The rider becomes a real gentleman with the role to educate the horse helping to overcome his natural patterns of compensation that it would otherwise instinctively adopt in an attempt to provide some answers to the rider’s aids! This work involves taking total responsibility in a relationship based on scientific knowledge, feelings and passion. Getting results is only a matter of time. As with a river, when water flows towards the waterfall, it does not need to fight to be fast! For the gentleman, the modern rider, this represents a challenge: the elements are comprised of an ancestral language that appears in its nakedness, deaf, blind and mute. To learn it requires great sensitivity and the ability to give up the idea of control. The results is the elimination of one’s ego through the communication of intuitive equine touch where every “aid” must be presented to the horse as an extension of his evolution and his free and natural way of being.